A faulty part has delayed the installation of Boulder City’s new backup transformer by one year. 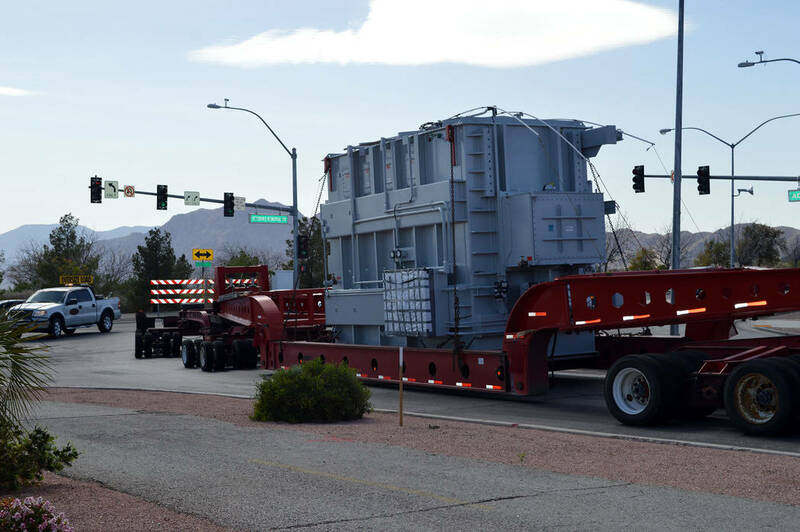 Installation of Boulder City’s new backup transformer, which was delivered almost a year ago, has been delayed until October because of a faulty part. A leak in the new transformer was discovered in July, four months after its arrival, and staff contacted the manufacturer, according to Lisa LaPlante, the city’s communications manager. The new part was installed in January. Staff tested it to ensure it does not leak and the part passed inspection, LaPlante said. Until the transformer was complete and ready to use, the city held on to part of the payment to the manufacturer, Virginia Transformer. The new transformer, which costs $1.1 million and weighs about 109 tons, will increase the reliability of the city’s electrical system. The new backup transformer is now expected to be operational in October. The delay has not caused an increase in cost. Though the transformer, which will serve as the backup to the main electrical system, is ready for the next step for installation, the city has chosen to delay the process to get through the hot summer months. If the existing transformer is disconnected from the Western Area Power Administration and there were any issues installing the new transformer, the city would be left without any backup to its power-supplying system. In addition to the transformer, the city will be installing a new circuit breaker and other items for the system, which were purchased earlier. “City staff has determined that starting phase 2 of the project now, this close to summer, is needlessly risky. … The better course of action is to continue to rely on the old transformer for backup power this summer and to commence breaker replacement starting in October 2019,” LaPlante said. In 2017, then-Public Works Director Scott Hansen said the process to replace the more than 50-year-old transformer would not affect daily service for the city’s electrical customers. It would, however, be critical to serve the community should there be a problem with the city’s primary power source at the Mead Substation. When the new transformer was delivered in April 2018, Rory Dwyer, who was the city’s electric utility administrator, said the existing backup does not have the capacity to deliver the large amount of energy needed during the summer. According to LaPlante, the city holds a five-year warranty on the new transformer, which began now that the final payment has been released.